Beamish is taking on a distinctly militant feel this week, as we get ready for a very special weekend of activity to celebrate the North East’s suffragettes. On the 29th and 30th of June, we’ll be commemorating the centenary of Emily Wilding Davison’s death and remembering the women who fought for that most fundamental of civil rights – the right to vote. There will be lots happening at the museum, and you can find out more here on our website: http://www.beamish.org.uk/suffragette-celebration-weekend/. We will be doing special behind the scenes tours of our collection store all weekend (come and see us, it’s worth it! 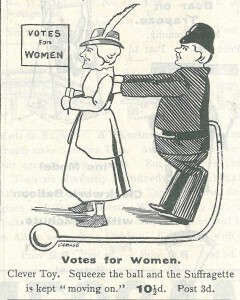 ), and in preparation I’ve been having a look to see if we can find some suffragette stories in the Beamish collection. A peek in the Beamish trade catalogues always comes up with interesting results – we have hundreds in the collection, from Victorian dentist’s supplies to 1980s Kay’s catalogues. Normally,a look through the 1909 edition of the A.W. 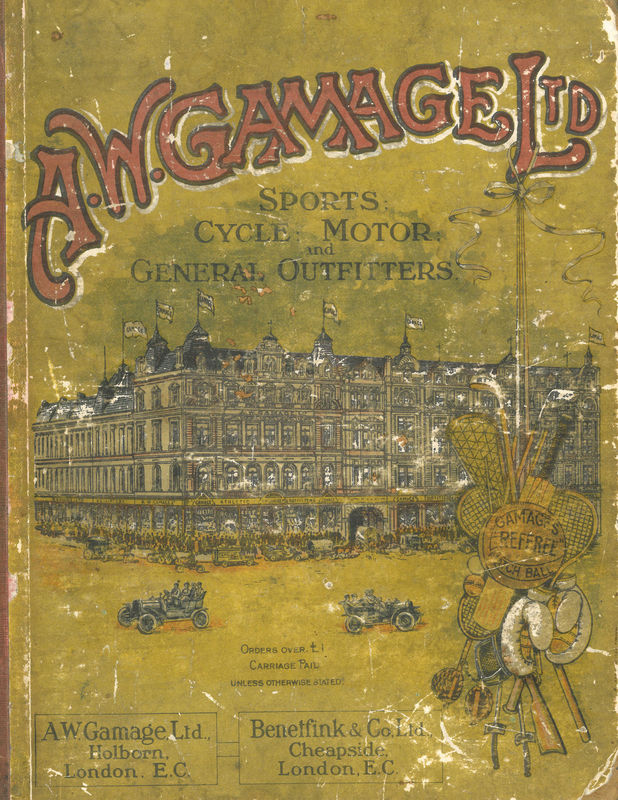 Gamage department store catalogue wouldn’t be expected to turn up a suffragette surprise, but it is amazing what you can find if you look carefully enough – and what these finds can tell us about society and attitudes. Gamages were particularly renowned for their range of toys, games and sports equipment, including complex mechanical toys – Arthur Walter Gamage founded the store in 1878 as a watch repair shop, so clockwork mechanisms were a speciality. This catalogue is a pleasure to read, full of ingenious games and novelties. However, on one page, there are two somewhat shocking items among the jumping jacks and wooden animals – two mechanical suffragette toys. It is difficult to know what to make of these images – to modern eyes they seem odd and sinister, but they are not unique. 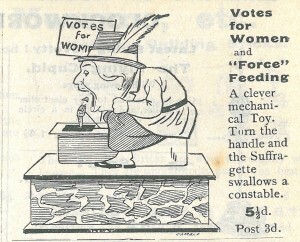 Many toys and boardgames were inspired by the women’s suffrage movement – often aimed at adults rather than children, and sometimes cruelly satirical. 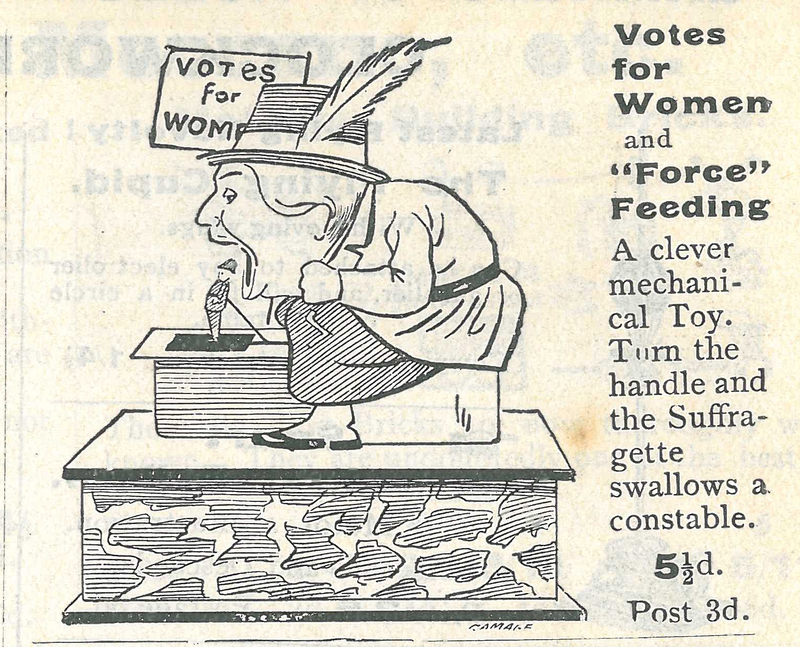 Whilst our two Gamages examples are a more of a parody, pro-suffrage toys could be found too – some women’s suffrage organisations produced board and card games and toys to raise awareness of the movement, as well as much needed-funds. In 1908, the Manchester Doll Show even included a ‘Suffragette Exhibit’ within its displays. Toys and games have always reflected the attitudes, concerns, and (crucially in the case of women’s suffrage) the fears of the society that produces them. If the Gamages toys tell us anything, it is that by 1909 the women’s suffrage movement had captured the imagination of the public. For better or worse, the suffragette was a recognisable enough character to feature as a commercially produced toy – she had become a part of Edwardian popular culture! What do you think of these ‘novelty’ suffragettes – are they comic or cruel? What do they tell us about Edwardian attitudes to the women’s suffrage movement? This entry was posted in Adventures in Collecting and tagged A.W. 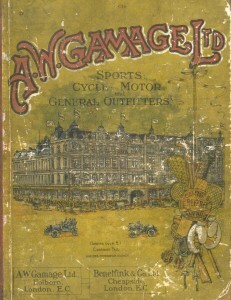 Gamage, centenary, Emily Wilding Davison, games, suffragettes, toys, trade catalogues on June 24, 2013 by BeamishMuseum.